Stop whatever you’re doing. Right now. That’s right, I’m talking to you with the Sausage Omelette halfway between your plate and your mouth. Oh, and don’t drink that Borovan, either. I poisoned it so you wouldn’t pay attention to it and you would to this article, K? So, the conspiratory issue I’m talking about today is: governments. How many of you actually think about how this planet is run? Yeah, you have the Faerie Queen, and Dr. Sloth, and those weird TNT guys, but they can’t be everywhere. And it’s the moral responsibility of every Neopian to know who is in control of them. I don’t believe anyone does. In a recent survey, 83% of all users believed that funding for their Neohomes came from “that magic flying bird thing.” Now while this may not be impossible due to the strangeness of the world we live in, it’s still highly improbable. The citizens deserve to be informed. I know what you’re thinking. You’re saying “Wow, pk! You are so intelligent! I never would have thought of this intriguing issue without your insightful observations. Please have the rest of my Sausage Omelette!” No, really, I can’t take that from you. My psychiatrist says I’m not allowed to take gifts from readers. I could use a few Halloween Paint Brushes, though. While you’re all going through your Deposit Boxes, feel free to check out this handy Government Guide to Neopia, indexed by location and average density. Mystery Island: This lush paradise surprises us with it’s odd government. If you check in with anyone who actually followed the plot more than a year ago, then you’ll remember that Mystery Island is actually controlled by five powerful agents: Jhuidah, the Tombola guy, the Island Mystic, the Techo Master and, for some reason, that scrawny little coconut tour guide Kiko. I’d say this is a textbook example of a Pentumverate, where all power and control over the region is equally shared between all five of them. At least until one of them is secretly murdered, and users must solve a series of tricky clues and devious puzzles, all while the remaining members and suspects are disappearing themselves...oops, I’m giving away the secret plot for next year. Hee hee...please don’t kill me, Donna. Roo Island: Roo Island appears to be populated by, and named after, King Roo, making it a Monarchy state, where the country is run by a leader who gambles away the national treasury with the help of five loaded dice (the sixth one is a secret!) and a nifty rare avatar. Well, something like that. I never was very good with definitions. Faerieland: Some might also call Faerieland a monarchy, as it is run by the Faerie Queen. However, consider this logically. If the Faerie Queen were a ruler, than she would admit her existence. She does not. Instead, she hides in the one corner of Faerieland that she insists does not exist. Therefore, we can assume that the Faerie Queen, while she once ruled the Clouded city, now strives to not be seen. Thus, Faerieland becomes classified as a Successor State, where the monarch has moved on and the whole place is run by democratic votes. Everyone pretends the place is still controlled by Queenie, but it’s really every Neopet, Faerie and Discarded Magical Blue Grundo Plushie Of Prosperity for himself. Or herself. Or itself. Haunted Woods: Well, some might automatically assume that the Brain Tree is in charge. Because he’s, you know, big. And orange. But the government falls just short of a Democratree State due to the fact that the big Log is being spoon-fed information from the Esophagor. Wait, no, it’s not really run by him, he gets all his food from Edna. And she gets random items from the users of the Haunted Woods, who get beaten up by the Brain Tree...okay, I’m just calling this one a Democracy. Because it’s a long chain of events and pointlessness where everyone has a worthless vote. (What? I can’t put political commentary on this site? Dang!) Then the Woods are a...Magicracy. Run by Magic. Magic Puppies. Hee. Jelly World: Okay, once and for all, people. JELLY WORLD DOES NOT EXIST! It’s insane! Think about it! A whole world made out of Jelly? Pfft, yeah. That’s about as likely as a game where Petpets jump on seesaws to catch inexplicable hovering fruits. Get over it, folks. It’s a hoax. On an unrelated note, if such a world did exist, then it would most likely be classified as a Jelligarchy. Government by the jelly, for the jelly. Krawk Island: With it’s roguish shores, madcap antics, and personal type of currency, Krawk Island is an Independent State. It does not attend U.N. meetings (United Neopians), as it is an unorganized crowd. Until they learn to embrace the value of the Neopoint, they will never have a niche in this modern-day world of commerce and garlic. Meridell/Brightvale: More Monarchies? Perhaps. But Meridell is a vast empire that branches to Meri Acres Farms, the Darigan Citadel, two huge castles and sometimes the neighbor state of Brightvale. This is too much for a single ruler. Especially one as simple minded as Skarl. 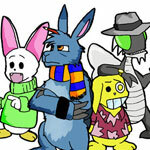 (Sorry, but someone who’s amused by the incoherent babblings of a million Neopets a day? Not exactly King material.) Thus, I classify this state as a living example of Feudalism. Picture a giant pyramid, possibly made of Turnips, with Skarl at the top. His next-in-commands, say, Hagan and Jeran are on the next level. Reporting to them, are, say, Morris, Lisha, Kayla, Sinsi and the Turmaculus. And so forth and downwards with each level only concerned with whoever is immediately above and below him. Thus, everyone is a leader. Except those at the bottom. (Slorgs, Draik Eggs, Lennies and Pet Rocks.) As an added bonus, it’s only a matter of time before Hagan becomes annoyed and rips his branch of the pyramid out from under Meridell’s cloak, thus collapsing the entire system into utter decay and chaos. Bring some popcorn; let’s watch! Kreludor: Does anyone even live here? Well, yeah, Orange Grundos, I guess. But they really don’t count for much. Besides, they’re all being exported quickly so that millions of users can bag a Forever Orange avatar. Add this to the fact that it’s only a matter of time before either Sloth, the mining experiments, or that weird Neocola machine blow the moon into asparagus-sized chunks, and you’ve got a Deserted State. People used to live here. Now they move somewhere else, preferably somewhere with oxygen. Kiko Lake: Well, here you’ve got Kikos. And more Kikos. And...well, no one but Kikos live here. So I’m tempted just to call this a Kikocracy, as there is no one to govern or to be governed but those lovable little...uh...Ok, what exactly is a Kiko? It’s not a reptile, and it’s not a fruit...so...I mean, seriously, it doesn’t have legs! I’m so very tired. Terror Mountain: So, you’ve got a state run by thousands of Democratic Bruces in the valley, but the Ice Caves are under the tail of the Snowager who never leaves his post... but the most powerful individual is the Snow Faerie who stays in an Igloo atop the mountain...and we haven’t even gotten into the Bori colony deep INSIDE the mountain, plus the giant mutated Moehog and his descendants. Man, it’s times like this I need coffee badly. *SSSSSSSIIIIiiiiiiiiippppp* Ahh, much better. Well, I think I’ll just call this a Confusious State, named after ReallyConfusious the Meerca, who lived back in Y1. Like him, this whole sector is just craaazy. Tyrannia: A perfect example of an Oligarchy. A government where the military took over at one point and kind of decided not to leave, since they like the free omelette and the groovy music and the sedate Wheel-Of-Monotony pace of living around here. I mean if you go to the Town Hall, all you hear about is ‘We stopped the Monocerous! Or the Monoceraptor! It’s been so long that we can’t remember his name! But we stopped him! Go us!’ That’s all they needed to do, and they managed to take control of the biggest omelette in the world. They must be stopped. Neopia Central: Shop til you Drop! This is the only area of Neopia with a higher shop-per-square-foot ratio than Brightvale. You have regular food, baked food, low calorie food, smoothie food, pizza food, hot dog food and Turmaculus food at the petpet shop. You can buy toys or gifts or instruments, coins or stamps or clothes. Magic weapons, Magic armor, Plain Magic and Magic Hair Gel. Is there nothing that can’t be found in this madcap realm of buying, selling, haggling, dealing, wheeling, stealing, stocking or trading? Hello, Capitalism. Wasn’t that fun? I know, getting shiny trophies is fun. Oh, wait the readers. Well, I hope you all enjoyed the article. It’s my tenth, so if you want to drop a mail, you’ll find me on the neoboards relentlessly flaunting it. See ya. Oh, you can drink that Borovan now. I covered my eyes as I looked at the enclosed picture of my strawberry fields painted Poogle friend. I read it one more time. Hidden place? What hidden place. Never… never had I heard of our hidden place. This had stumped me.